Yes, I even worked at McDonalds too. The year was 1986, thirty years ago and I was eighteen years old and homeless. I think the boss and my co-workers knew that I was homeless since they always used to ask me about the huge backpack I always carried, but they let me work anyway. Coco, my boss, had a huge crush on me but I thought she was kinda homely, so I didn’t reciprocate. She later worked for Safeway and then BART. I last saw her there and she still held a grudge. I thought that very petty since twenty years had passed. 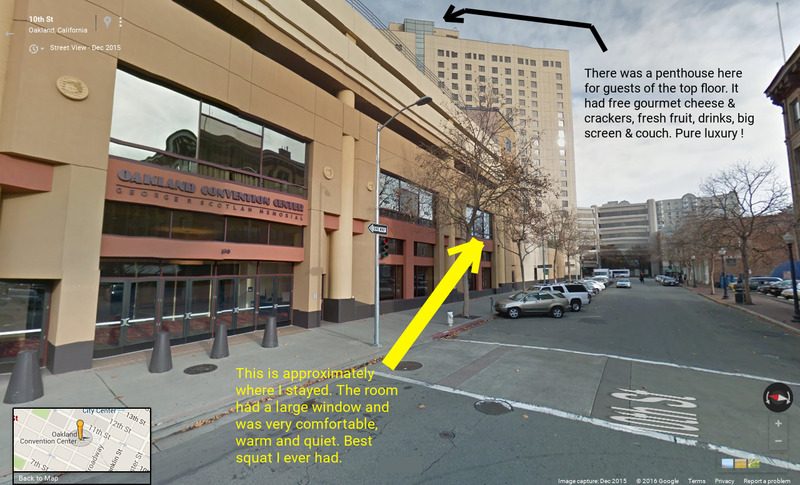 I was staying at the new Hilton Hotel in downtown Oakland that is now owned by Marriot. The parking garage that I was squatting in is now the Golden State Warriors training facility. Apparently at one time there was a parking attendant near the elevators because a desk still remained. I used to lay down behind the desk and sleep, since the garage was actually a separate building apart from the main hotel. No employees ever came in there, except at the end of my stay four months later. I think another reason was that the place was so new that many employees didn’t even know that part of the hotel existed. There was also a storage room that was full of rolls of carpet that made decent bedding. 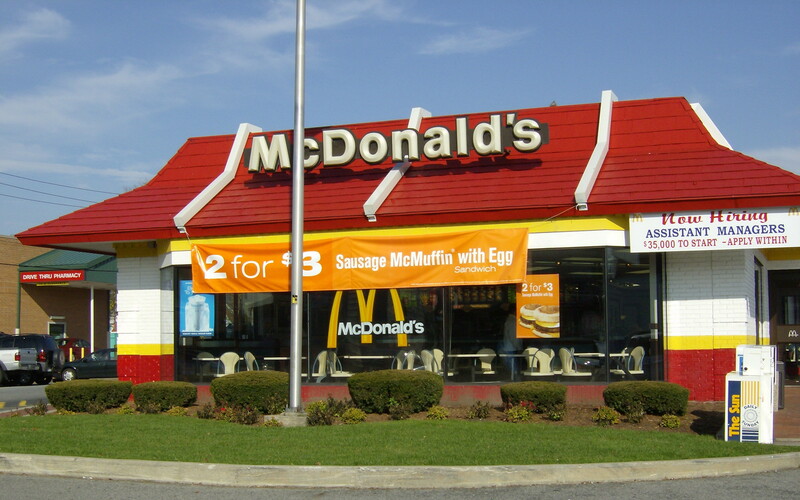 In the days before getting the McDonalds job I would sit behind the desk with a fifth of whiskey discreetly hidden and look out the window, greet guests as they came in, they were always nice, one even gave me a twenty dollar tip. The restaurant manager who hired me was named John. He was a nice guy. Oh, it may be a good time to mention that everyone who worked there was black. I really only mention that for cultural context, so you get a clearer picture of the story and mostly because the workforce of that time is so different than today. 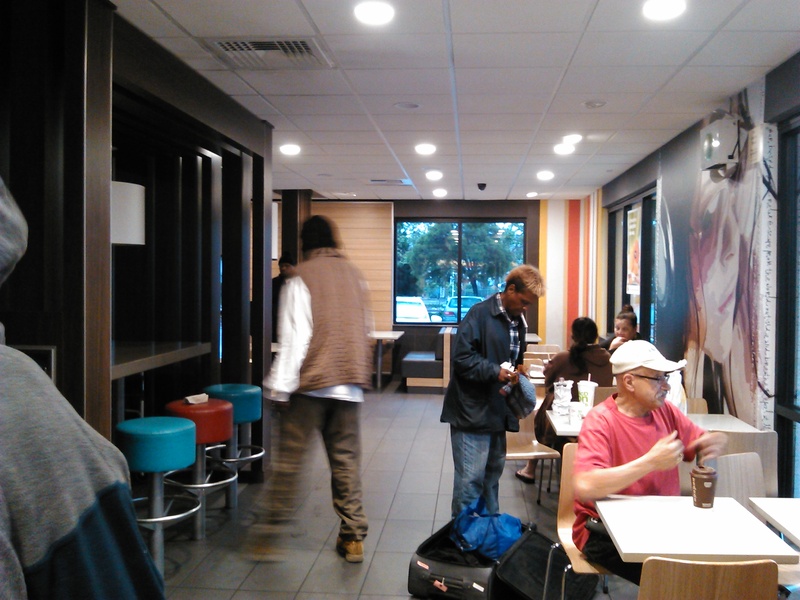 I’ve found that unless I go to a McDonalds in a predominately black area, like Hunter’s Point or parts of East Oakland, I rarely see any black folk working in them. So different from the way it used to be. McDonalds back in my time used to be the default summer job for black kids who were about something and now, it seems different. Hey, if an old guy like me doesn’t tell you, how would you know? Anyway, I still don’t know why John hired me but he gave me a chance. I thank him for that. I abandoned the job for a paid full time training course given by the National Guard but that, is another story. Cocoa was the assistant manager and my immediate manager was “Thadeus” (I can’t remember his real name). Thadeus took me through a tour of the place and showed me how everything worked. Along with the tour came introductions to my co-workers. There was a thin guy who seemed much older than his age and wore an Afro complete with a green, red and black “Black Power” pick. Then there was the thick bombshell who gave me a quick “Hi” as she lighted away is if being chased, she handled the drive through. On pots and pans was a guy who could have been my brother as far as looks go, he was very nice but seemed to have a special relationship with Cocoa. Perhaps that was why she took such a liking to me. I was first put on pots and pans, the lowest man on the Totem Pole because I was new. When you do P&P you stay wet for your entire shift. I didn’t mind since every industrial kitchen job I had worked in up to that point usually had me assigned to pots and pans, I was used to it. What was hard to get used to was the amount of noise they made banging around in the sink, stainless steel is very loud. Just think of a monkey beating on steel drum for eight hours. LOUD. The greasy water wasn’t fun either because it greased up your uniform and made the tile floor slippery. Slippin and sliding, fighting to stay upright while wrestling with big steel utensils gives one a full body workout PX90 couldn’t match. One merciful thing about working pots and pans is that you were all the way in the back of the restaurant and rarely saw any of your co-workers, you certainly didn’t interact with any customers. I stayed back there for about two weeks. The position was supposed to be rotated among all employees but in reality I and the only other strong male (Coco’s pet) alternated. The laws against discrimination being what they are today, you probably couldn’t get away with that now. I volunteered to do my co-workers rotation which gained me their popularity, they dare not offend me since I could just refuse to cover their turn at pots and pans. In all fairness both the supervisor and Coco would always come to me and tell me that I didn’t have to cover for the others, they were nice about that. Eventually, they took me off pots and pans by force and stopped the others from taking advantage of me. I must admit that I was grateful, I was getting tired of being wet and greasy. My shoes were taking a real beating and I only had one pair. My uniform also had to be washed after every shift, not an easy task when you don’t have a home to go to. I was then placed on grill. This is where my theft from the employer began. I stole extra hamburger patties, cheese, whole burgers even sometimes. What did I do with all of these extra food items? I gave them to the customers. I was giving food away. I now understand that to be theft. 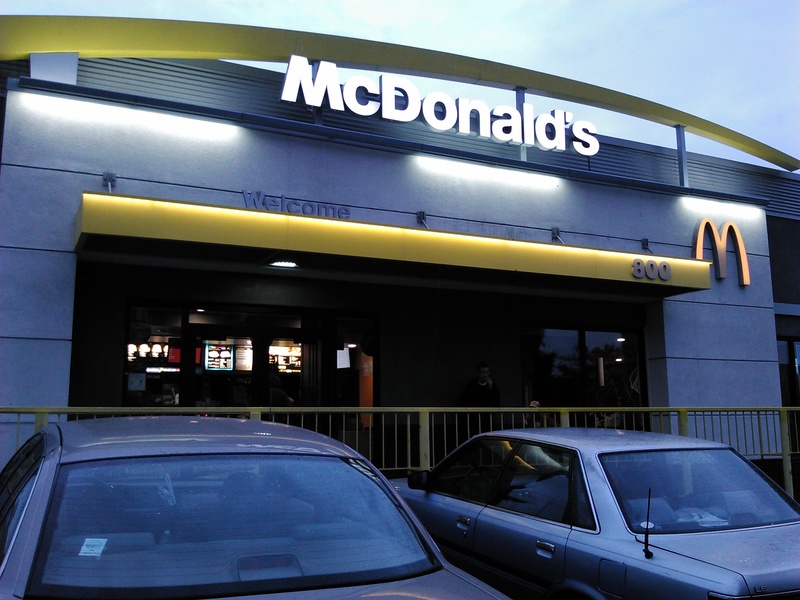 Surprisingly, some customers complained that their Quarter Pounder had two hamburger patties instead of one, or that their cheeseburger had an extra slice of cheese. Coco the manager would gently admonish me every time I did it, but never got harsh. They kind of held a little discreet meeting about me and decided that I was harmless but weird and let it go. Finally, they put me back on pots and pans and I was no longer allowed on the grill. I just honestly felt that the customers deserved a little extra. I wouldn’t do anything like that again though, guess I’ve always kind of admired Robin Hood. I swept the floor, emptied the grease, stocked the freezer, broke down the shake machines for cleaning etc. etc. but eventually grew tired of the routine. Working in the food industry ain’t a whole lotta fun. At the end of every shift I was allowed to pack a box full of Chicken McNuggets to carry me through the night. That was one of the few advantages, we were allowed to make anything we wanted for ourselves at shifts end. In the beginning I made a few deluxe shakes and gorged on pies, but quickly learned that meat was best at staving off hunger. Those twenty piece boxes of Chicken McNuggets that I turned into bulging fifty piece boxes were life savers. Coco eventually found out that I was taking too many and banned me from the McNuggets but I had to have them so would sneak boxes anyway. A full box of those allowed me to stay hidden behind the desk without having to risk exposing myself to go get something to eat. 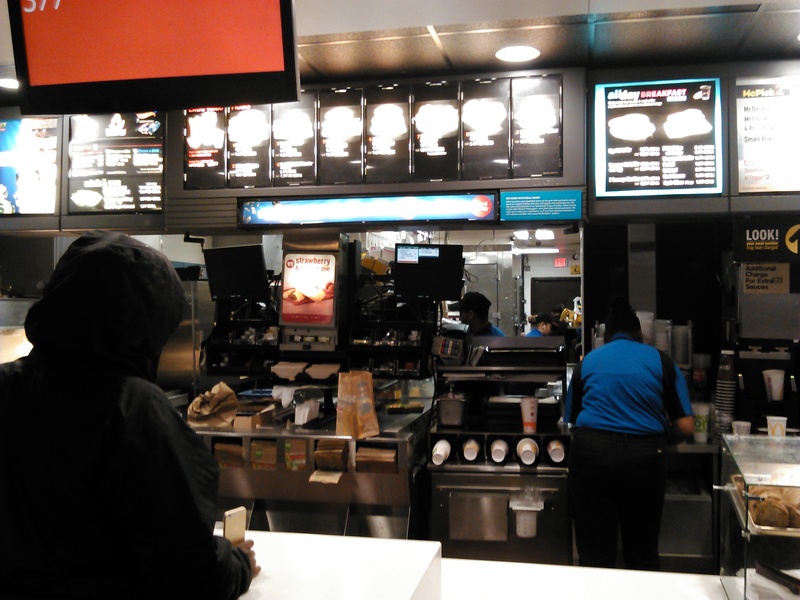 If I just took burgers they would get cold and nasty an hour later, the Chicken McNuggets were good either cold or hot and lasted long enough for breakfast. On the weekends they lasted until dinner. I was living off those things. Finally, I was challenged one night by a hotel employee, things at my chosen luxury hotel squat were getting dicey. I think he knew that I was living there in the parking garage foyer but chose not to report me immediately, just told me to leave and not come back. I didn’t feel comfortable after that and knew my climate controlled nights of sleeping behind the desk were numbered. Two weeks later he caught me again, sleeping in the storage room with my backpack hidden behind the desk. It was over. Shortly after I abandoned my McDonald’s job, I never returned the uniform either which is another regret. They were good to me and I should have exited properly but living on the street does things to your mind. All of us kind of played a mental game that ignored my homelessness. Coco would periodically quiz me about my backpack and where I was going after work, I don’t know if it was out of genuine curiosity or meant to be derisive but I didn’t care, it only irritated me once. All in all, I enjoyed my time working there and am glad that I can say that I was one of millions of teens who worked at McDonalds. I suppose it doesn’t carry the same cultural weight as a right of passage that it once did but I still cherish the memory. I cant’ say whether the company is now good or bad but I still eat a burger there from time to time. 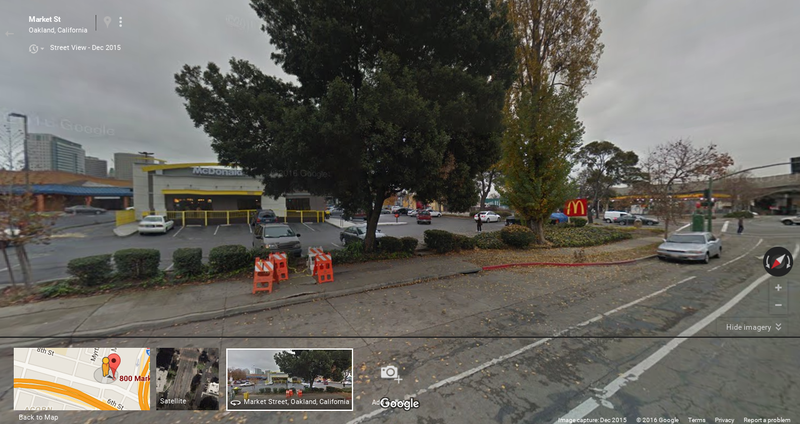 So long McDonalds and thanks for the memories.